In his groundbreaking book about the cloud, The Big Switch, author Nicholas Carr foresaw an epic change in “the nature and economics of computing,” with repercussions that reach far beyond the data center. That prediction from 2008 is holding up quite well as the cloud grows increasingly popular, and public, private, and hybrid options become mainstream business tools. Cloud computing today is fundamentally altering business processes and changing the way organizations interact with customers, partners, and employees. This transformation brings incredible opportunities, including the ability to build a realtime enterprise where interaction and innovation flourish, and more agile, flexible, and cost-effective practices thrive. Yet cloud computing also presents significant challenges. The path to value is not clearly marked, and there are potential stumbling points along the way. Research by Oxford Economics shows that the cloud already is central to strategic vision and operations—and that its influence is growing rapidly. As more and more business functions move into the cloud, organizations realize increasing benefits. ¦ Over half (53%) of respondents say cloud is a key to their innovation strategy, and nearly three-quarters (71%) expect the cloud to be part of the long-range vision for their business in two years. 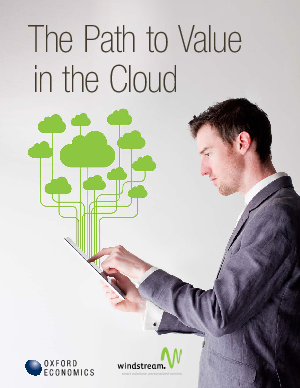 ¦ Geographic expansion and new lines of business are seen as key goals enabled by the cloud. Within two years, use of clouds to drive entry into new markets will increase by nearly 50%. ¦ Collaboration among business units (63%) and partners (59%), innovation (55%), and improved customer service (44%) are valued over increased efficiency (33%) and operational savings.